Until last week, I was not feeling the holiday spirit. I guess you could call me the Trump Grump. With so much uncertainty and fear in the air, I just did not feel like celebrating anything. Being in the holiday spirit means a lot to me. I have always thought it important to relish the joys of the season - it fills the coldness of winter with love and gratitude and kind warmth. I eventually was able to pull myself out of the pit and into genuine holiday happiness and so I wanted to share what I've learned with you. It is a terrible, although common, feeling to feel like one has to lie and say they're fine when they're not. When at my church two weeks ago and all I could think of was the fact that Trump is going to be president soon, I decided that I would tell people what was on my mind if asked how I was doing. So I did and both times it opened up genuine conversation instead of mere pleasantries. It felt good to know that I was not the only one internally struggling. This is getting validation and it's something everyone needs. 1. There is a difference between sharing and wallowing - sharing in an effort to receive validation is usually good; sharing but then refusing to switch to a cheerier subject after a long time of talking, so that one is only surrounded by negativity is usually not good - I know because I used to do the latter all the time years ago. 2. Be careful of who you go to for validation. Fortunately, I go to a very liberal and progressive church, so I already felt sure that whoever I talked to would probably be understanding. There are other people in my life, however, that I would probably not share why I was struggling with, as I know they would blow it off as an unimportant concern. Opposite action is a DBT skill that can be hard to do. It's basically doing the opposite of what you are feeling like doing in an effort to produce a different feeling. After church that Sunday, it was time for our annual caroling around the Kirkwood area. I love caroling and look forward to this event all year long - when I was a kid I learned all the verses from almost every carol because I loved it so much. Now, I amaze people by knowing how Miss Fanny Bright got upsot in Jingle Bells and how we are supposed to strike the harp and join the chorus in Deck The Halls. Unfortunately, I was still feeling a bit gloomy and didn't want to join in the caroling this year. I thought about how I had switched shifts at work so that I could go and how I loved going in previous years. I remembered the opposite action skill and decided to get on the truck and go for an hour in the hopes that I would feel more like in the Christmas spirit afterwards. It worked! I sat beside a good friend of mine and we made jokes and sang the whole way. I impressed her with my knowledge of obscure carol lyrics. Basically, by totally immersing myself in something that has given me pleasure before, I was able to change my mood and I am so glad I did. Traditions make us feel in touch with our roots and be grounded. Unfortunately, it can be hard to have the motivation to do them if with different people or in different environments than in the past. When I was younger, my mom and I would make cranberry bread every year - Christmas just didn't feel like Christmas without it. It's moist, tangy and sweet at the same time - so, so good. Unfortunately, ever since I moved out of my parents' house, I haven't been as engaged in the old traditions and I hardly ever do holiday specific cooking anymore. Last Wednesday, I had my peers and I make my family's traditional cranberry bread for whole health. It's not really a healthy bread but I told them being mindful of holiday traditions is. It's funny how what we do to teach others usually ends up helping ourselves most of all, because making that holiday bread with my peers is what finally totally turned my frosty mood around. I had thought that I wouldn't like making a family food away from my family but I found that wasn't true - instead, I felt more connected to the people around me while still feeling connected to my roots. Eating that tangy, yet sweet bread again and sharing it with new people that I love and care for finally opened me to feeling the holiday spirit. Of course, there is no rule that you have to get immersed in the holidays, but I will posit that getting connected to people that care is always a good thing. Thinking of others outside of ourselves, honoring traditions, receiving and giving validation and being authentic are all good things no matter what time of year. If you are feeling bitter or cynical this year, and there are many good reasons to feel that way right now, I urge you to look for something that you can do to alter your state of mind. 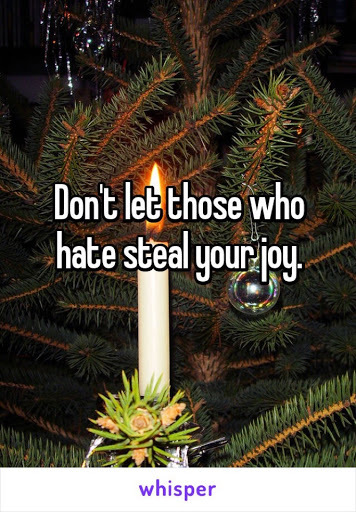 Despite the long road ahead politically, we must never let those who hate steal our joy.